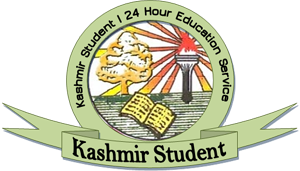 In a major concern, the University of Kashmir is covertly jeopardizing the career of hundreds of students by sending their answer scripts for evaluation to ‘inexperienced evaluators’ outside of the State who resort to ‘reckless assessment’ of papers. 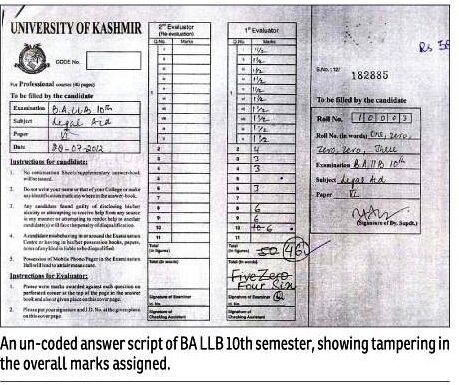 The answer scripts of BA-LLB 9th and 10th semesters, accessed by Greater Kashmir, reveal how the evaluators have left many answers unevaluated. The varsity authorities are, sadly, silent over the grave issue. In one of the papers– Evidence Law-II– the concerned evaluator has left almost two questions from every script unevaluated. According to a former professor of the Law Department, many answers have been ‘unfairly’ evaluated. “I was astonished to see the reckless evaluation of answer scripts. So many candidates came to me to confirm whether the evaluation was fair or not,” said Dr Shafiq Ahmad Rathore. “It is surprising that evaluators have left many questions unevaluated. They have also failed many candidates who otherwise pass.” The varsity is also bending norms by not coding the answer scripts before sending them for evaluation. The external examination of the subject, Evidence Law-II, was held on August 12, 2012. Thereafter the answer scripts were sent for evaluation outside state. The case with other disciplines is similar. The University sends answer scripts of external examination of every discipline outside state for evaluation. Similarly, the evaluators have resorted to unfair marking in another paper–Legal Aid–by leaving couple of answers unevaluated from every script. Again, the answer scripts were not coded. Also, the evaluators have changed marks on the front pages of the scripts after transcribing the numbers— something which is against rules. Moreover, many marks transcribed on the front page do not match answer-wise. Evaluators have also recklessly assessed the BA LLB 9th semester papers. The paper– Interpretation of Statutes III– was also not coded before send for evaluation. Dr Rathore said the Kashmir University was devastating the career of students. “It is clear that scripts have been evaluated by inexperienced evaluators. 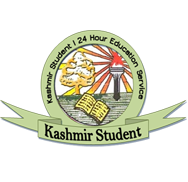 This is one of the grave problems with Kashmir University,” Rathore, who has taught Law of Evidence at Kashmir University for several years, said. When contacted, Controller of Examinations Prof A S Bhat said he will look into the matter. “It is true that some evaluators are reckless and resort to such things. I will look into the matter and see what has gone wrong,” he told Greater Kashmir. 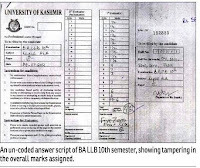 An un-coded answer script of BA LLB 10th semester, showing tampering in the overall marks assigned.